Graduation and passed or appearing in final year of 2- year Diploma in Elementary Education (by whatever name known). Graduation with at least 45% marks and passed or appearing in 1- year Bachelor in education (B.Ed), in accordance with the NCTE (Recognition Norms and Procedure) Regulations issued form time to time in this regard. Senior Secondary (or its equivalent) with at least 50% marks and passed or appearing in final year of 4- year B.A/ B.Sc.Ed or B.A.Ed/ B.Sc.Ed. Period for Online Corrections in Particulars (No correction will be allowed in any particulars after this date): 20-07-2016 to 25-07-2016. Download Admit Card from CTET website: 17-08-2016. General/OBC Category: 600/- for only paper I or II and Rs. 1000/- for Both Paper I & II. SC/ST/Differently Abled Category: 300/- for only paper I or II and Rs. 500/- for Both Paper I & II. Go to CTET official website www.ctet.nic.in. Now Go to Apply Online. Upload Scanned Images of latest Photograph and Signature. Print Confirmation page for record and further reference. 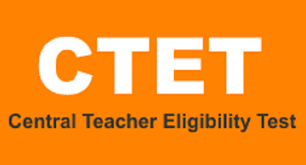 For more information you can visit the official site www.ctet.nic.in.